The 8th Edition of the Multilateral Kant Colloquium will be held at the University of Catania, October 11-13, 2018. Scholars from all over the world will be involved in presentations and discussions of the most up-to-date research on Kant’s philosophy. Invited speakers include Professors Mario Caimi (Universidad de Buenos Aires - Conicet), Bernd Dörflinger (Universitaet Trier), Luc Foisneau (École des Hautes Études en Sciences Sociales - Paris), Luca Fonnesu (Università di Pavia), Paul Guyer (Brown University), Pauline Kleingeld (University of Groningen), Heiner Klemme (Martin Luther Universitaet - Halle Wittenberg), Robert Louden (University of Southern Maine), and Patricia Kauark Leite ( Universidade Federal de Minas Gerais). 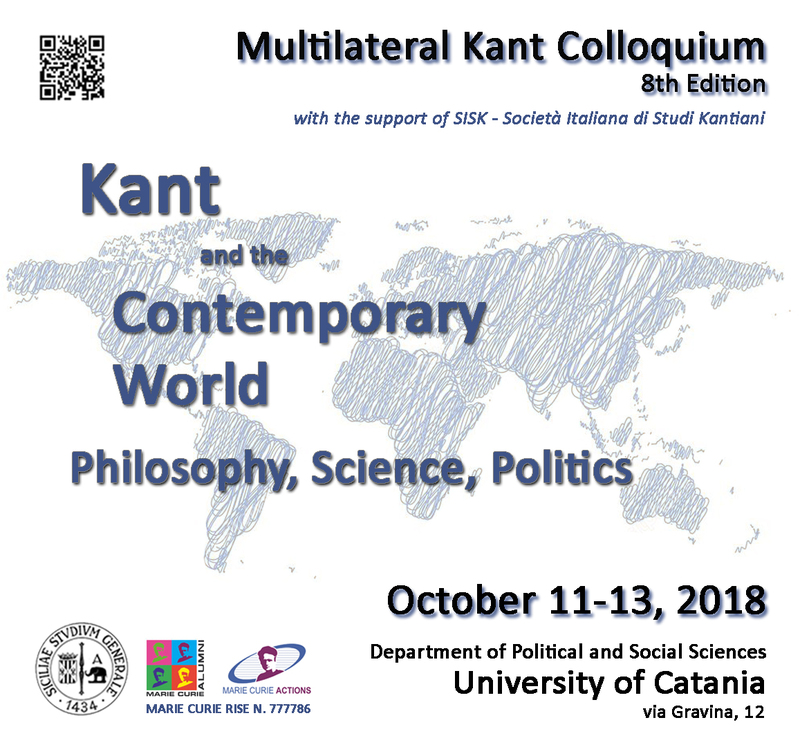 With the support of the SISK, MCAA and MARIE CURIE RISE, the conference is part of an annual initiative started in 2008 by an international group of scholars keen on promoting informed debate on the latest developments of Kant scholarships. Previous editions took place in Italy (“Kant Today”, Verona and Padua), Portugal (“What is Man? – Was ist der Mensch?”, Lisbon 2009), Germany (“Kant and Antinomical Thinking”, Mainz 2011; and “Kant and His Critics”, Halle 2017), Brazil (“Kant and the Metaphors of Reason”, Tiradentes 2013), Spain (“Kant’s Short Writings – Kleine Schriften”, Madrid 2014), and the United States (“Kant on Violence, Revolution, and Progress”, Hempstead, NY 2016). The current edition aims at highlighting the relevance of Kantian thought with respect to the contemporary world, which becomes increasingly acknowledged in a wide number of issues crosscutting both the theoretical and practical sides of his work. The Colloquium is addressed to scholars at an advanced stage of their career as well as junior researchers with an interest in Kantian philosophy. Participants will find the ideal context for high quality feedback on their ongoing work and challenging discussions. Over three days, the conference will be structured around 10 invited talks and presentations selected through a call for papers.